Are you planning on replacing the windows of your Toronto home? If so, then you have probably been faced with many different decisions, one of which is choosing a window style. Each style has its own unique set of features and characteristics. In order to choose the window style that best serves your Toronto home, it’s a good idea to get acquainted with what each style offers. 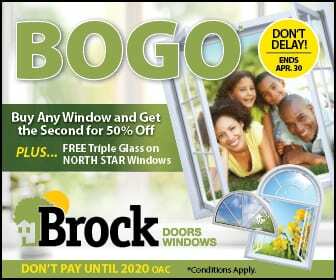 This practical guide from the knowledgeable folks at Brock Doors and Windows will help you do just that. This type of window is perhaps the most popular style for Toronto homeowners. The features of the double and the single hung windows are very similar. With the double hung window, the bottom and top sash slide up and down inside the frame. The latest models also have a very convenient tilt-in feature for easy cleaning. Single hung windows are almost identical to the double hung style, the only difference being that only the lower sash slides up and down. One advantage of the single and double hung window is its ability to fit well with most traditional house styles. The sliding mechanisms make these windows exceptionally easy to operate, and they are excellent for providing ventilation to a room. This type of window is also known as a sliding window and it operates by sliding along the window frame horizontally. Much like double and single hung windows, slider windows are a common choice among homeowners. The reason for this is that they provide your home with nice, bright open views. Casement windows have hinges on the side of the window frame, which allows them to swing out right or left like a door. Casement windows are easily operated by a crank, which makes for outstanding ventilation. Some types of casement windows don’t have cranks, and instead have a pair of sashes that can be pushed out. Casement windows work well with an older architectural style of home, such as colonial or Victorian. They are also very popular in new construction. Awning windows have a lot in common with casement windows, with one main difference. Casement windows open with hinges mounted at the side, while awning windows have hinges at the top, instead. This way, the awnings can be kept open even if it is raining, keeping you nice and dry while still enjoying the fresh air. Bay and bow windows have one central window, and two side windows. This style projects outward from the side of the house, creating the illusion of more space than there actually is. Bay and bow windows are ideal for a breakfast nook, and since they have deep sills, they are a convenient place to install shelving or display plants. As the name implies, picture windows are great for framing beautiful views and letting in light. However, they are fixed, meaning that they can’t be closed or opened, so they are probably not the best choice if you want ventilation. Picture windows are perfect for homes with high, vaulted ceilings, and they are often installed as an arch window over decorative areas. When none of the traditional window styles quite meets your needs, custom made windows are the way to go. The color, shape and design options for custom windows are virtually endless! This makes them a fantastic choice if you want to add personal charm to your Toronto home. Brock Doors and Windows of Toronto is here for you with any window style you can desire or imagine, so give us a call today!